So very excited to welcome back Joana Starnes to Austenesque Reviews today! If you haven’t noticed, Joana has been quite the busy author lately. She has had three novels come out in the last 12 months and has been on all sorts of wonderful and envy-inspiring holidays throughout England, including Bath, London, The Lake District, Lyme Park (Pemberley 1995), and Cornwall! This photo of the coast is just stunning, isn’t it? Thanks, Meredith, for welcoming me back at Austenesque Reviews to talk about my latest novel. It’s such a joy to be here again! ‘The Falmouth Connection’ is a ‘Pride & Prejudice’ variation that begins at Hunsford around the time when Mr. Darcy decides to go ahead and make his disastrous first proposal. He does not get the opportunity – and we all know that it’s for the best! He has no inkling though and is severely disappointed when Elizabeth is suddenly summoned to Falmouth to meet a great-aunt she never knew she had. Little does Mr. Darcy know that as a result they would both become embroiled in a tale of deceit and peril. There would be smugglers involved, of course – it is 18th century Cornwall after all! But smugglers are the least of Mr. Darcy’s worries as he finds himself forced to question other people’s motives and especially Lord Trevellyan’s, a landowner of great consequence whom he suspects to be a dangerous man and, worse still, a rival. But you will have to imagine it in the middle of the night. It’s very late and there is no moon, not anymore. It’s very dark, much darker than in this nighttime picture. Too dark, in fact, to see what is before your very eyes. A few hours earlier, Elizabeth had been obliged to venture out – and she had found more than she had bargained for in the woods surrounding her great-aunt’s gardens. And now she is returning to the house after a series of troublesome encounters, only to discover that the eventful night is not over yet! Breathless with the swift trek uphill and with the terrors of the night, Elizabeth hurried to the house. The garden door would not be open, surely. Would they hear her if she knocked? Perhaps not. Perhaps she should walk around to the main entrance. She rushed forth noiselessly over the damp grass – and stumbled into something or someone in the darkness, only to find herself caught and held tightly in strong arms that would not let her fall, yet at the same time prevented all escape! Before the cry of utter horror could leave her lips, a deep voice, warm and earnest, stilled her struggles and set her thoroughly at ease – for she would have recognised that voice anywhere. The words did not sink in. Not yet. Not quite. But their fervent cadence reached her, along with the overwhelming certainty that this was not some unknown aggressor. It was Mr. Darcy – and she clung to the folds of his cloak with all her might, shaking like a leaf. Not for fear, though. The fear vanished as though it never was, to be replaced by the strangest weakness. Had he not held her, she might have collapsed, for her knees felt useless, about to give way, and her head was swimming. ‘It must be the shock,’ some wispy threads of reason sensibly claimed, but at this point she could barely heed them. Still shaking, and still gripping the folds of his cloak with trembling fingers, she could not think straight. She could only feel. And the only feeling she could readily identify, from the tumult and confusion that seemed to reign inside her, was unspeakable relief that at long last this was someone she could fully trust. Someone who came from her own safe, sane world, and not from this terrifying other, where one could not tell one’s friends from one’s foes! She was not cold – at least she did not think she was – and yet she felt herself shaking from head to foot with a violent shiver. Or was it a sob? Or both? Most certainly a sob this time, and then another, deep and wracking. She could not control them, which was terrifying in itself. She struggled for breath – and yet did not withdraw from the tight clasp of those arms, but unconsciously drew nearer. Support and succour and safe haven. How strange that she had never felt as safe before! It was the oddest certainty that nothing could harm her now, and the relief made her positively dizzy, after the events of this long night, without a doubt the most frightful she had experienced in her entire tame existence! The sobs subsided, tempered by the novel thought, and no less by the equally novel, barely perceptible sensations. A light touch of warm lips on her brow, sliding to her temple. Cold fingertips brushing against her cheek – and yet the trail of their caress was not cold at all. It was hot. And tingling. Another touch of a cold fingertip on her lower lip, in a light stroke, so light that she could barely feel it. Her senses, previously dulled by the dizzying weakness, came suddenly alive, like hissing candles lit in very quick succession. She felt his breath upon her cheek, warm, rapid and uneven, and her own breath turned fast and shallow, as though to match the pace of his – then grew faster still when the narrow gap was closed, and his lips touched her cheekbone. They lingered there, dropping light, feathery kisses, and the cold fingertips were on her chin now, tilting her face upwards – or perhaps she had already done so of her own accord; she truly could not tell. “Elizabeth…” she heard him whisper, his lips still trailing a soft line on her cheek, and then the whisper gave way to a harsh intake of breath – and his lips were on hers. No longer soft and tentative, but searching. Deepening the kiss, over a length of time that seemed to be measured in thundering heartbeats. Her eyes flew open, yet she could barely see his face. The moon had long since hidden behind clouds and they were in the deepest shadows. She reached up, her hands seeking blindly until her fingertips encountered the hard jaw, the cheeks, ever so slightly rough, not perfectly clean-shaven any longer, and she explored their shape, strangely glad of the darkness as she stroked their contours, never before touched, yet ever so familiar just the same. Under her touch, the jaw tensed, and she could hear his breath becoming ragged as the kiss deepened even further into something her thoughts could not encompass. In truth, there was no room for thoughts, not anymore – otherwise she might as well begin to wonder what on earth was she doing in the gardens of Landennis in the middle of the night, kissed breathless by none other than Mr. Darcy, whose offer of marriage she had refused a few hours ago! There was no sense, no reason, just the exquisite kiss and the night that suddenly felt warm and gloriously perfect, after the reign of fear and of doubt. Come to think of doubt though, she might as well begin to doubt her sanity for allowing this to happen – but as his hands roamed across her back, clasping her so fiercely that she could barely breathe, she closed her eyes again, relishing the madness and the bewildering sensation of homecoming, into strong arms that would keep her safe. Her fingers travelled to the back of his head to stroke his hair, tangle themselves in it, as he brought her even closer – something she would not have thought remotely possible before – and his lips left hers to drop feverish kisses over her cheeks, her eyelids, only to return, just as insistent, just as searching, hungry. And she could not, would not deny him, any more than she could deny herself. Instead, her own lips parted, to better taste his delectable flavour, and a low sound rose in his throat at that, sending a shiver through her, from her scalp to her very toes. She must have taken leave of her senses lately – or perhaps it was this most unnerving night, or the soothing darkness, that made her lose touch with the world as it was, or at least as it should be. What madness had possessed her, to compel her to behave so wantonly, so wholly without boundaries or reason? And indeed heartlessly as well – for would he not be justified in thinking that she had reconsidered her rejection? Had she? Had she reconsidered? She had not… More to the point, she had considered nothing. She had not been guided in the least by reason over the last few moments – minutes – deliciously undetermined time that they had spent together in exquisite abandon, flaunting every rule, every consideration, every precept! In the end, she could not truly tell who broke the kiss. It might have been herself, in some belated acknowledgement of right and wrong. It might have been him – or perhaps both, in joint recognition of their untenable position, or simply in sudden need of air. Her breath did come very fast indeed, in forceful gasps, as though she had just run all the way up the hill, from the village – and his did also. Elizabeth could feel it on her tingling skin, and raised her face to it – only to find his lips again with a staggering, explosive burst of joy. It must have been the need of air then, earlier, and not some other argument that common sense dictated. Yet common sense had to prevail before too long or, if not sense, then decency and also common kindness, for surely she must not continue to mislead him in this fashion! With a faint sigh, she brought herself to turn her head away. Yet she did not withdraw from him completely, vainly searching for something to say that would convey the substance of her thoughts. Words would not come though, and that was little wonder, for there was no hope to do the faintest justice to the complex turmoil toying with her senses. Before she even tried, she was thoroughly distracted by strong hands cradling her to his chest, keeping her there, cherished and protected. And warm lips brushed against her cheek, next to her ear, as the deep voice spoke words of deep contrition. She could not let him continue to apologise for a fault that was as much her own as his – or even more so hers – and so, unthinkingly, Elizabeth raised her hand to his mouth. Another shiver coursed along her spine at the feel of his lips against her fingers. Worse still, she audibly gasped when his hand came up to cover hers and raised it by a fraction, until his lips were pressed against her palm, sending unnerving, nay, highly disturbing tremors through her. Not tremors, but veritable earthquakes! She swallowed and withdrew her hand, lest the staggering new sensations remove every remaining trace of sanity and compel her to tangle her fingers in his hair again and bring him back to her, his lips crushing hers as they did before, for those glorious moments! This time she did endeavour to withdraw from his embrace – it was by far the most sensible option – and although her intent was not immediately perceived, or perhaps it was perceived with great reluctance, his hold eventually slackened, and she was released. Yet his hands lingered on her arms, then lightly traced along them until her own hands were in his – which was just as well for, unreasonable as it might have been, Elizabeth felt she could have scarcely borne a full and immediate separation. “Why are you here?” they began at once, both in hushed whispers. For her part, Elizabeth could only regret the ill-judged and far too abrupt question, particularly as it seemed to convey the false impression that it was meant as censure. “I had no intention to cause you any discomfort, I assure you,” the retort came, wistful and earnest, making her even more acutely aware of her error. She hastened to correct it. She got to say no more. Her hands were carried to his lips again, if only for a lingering kiss on the back of her fingers, rather than the deeply unsettling feel of his mouth pressed against her palm, and Elizabeth found herself rather relieved by that – and also strangely and perversely disappointed. “What makes you say that?” he instantly asked, his tone alert and anxious. For the first time since the beginning of their unparalleled encounter a few minutes ago, Elizabeth was rather sorry for the lack of light. Reading his countenance was something she had never mastered, so ascertaining his reactions from the mere sound of his voice seemed a hopeless task. Nevertheless, she felt compelled to answer. Her sentence was cut short by his sharp intake of breath, and her hands were clasped so tightly it was almost painful. “Can you tell me where he is now?” he asked after a long moment, in a voice so rasping and so dreadfully uneven that he did not sound like himself at all. Her words were met by yet another gasp – nay, by forced deep breaths rather, as though he was struggling to quell the most violent distemper. His voice seemed to falter. It’s so very naughty of me to leave this on a cliffhanger, I know! But leave a comment to enter the giveaway and you might find out what happens next before anybody else does! Thanks for visiting and reading and thanks again Meredith for having me here! It’s such a pleasure to feature at Austenesque Reviews and you’re so very kind to invite me! Oh my goodness! That excerpt just made me melt into a puddle! Can’t wait to read the rest, Joana!!! You delight in teasing us, don’t you?!? I have so many questions! Thank you for sharing such a beautifully romantic excerpt with us today! Today, Joana brings with her two copies of newly released novel, The Falmouth Connection (2 ebooks), for me to giveaway to TWO lucky winners! To enter this giveaway, leave a question, a comment, or some love for Joana below! This giveaway ends November 5th! I hadn’t heard of this book yet. Adding it to my to read list 😀 I really liked the book “The Second Chance” that the author wrote so I am sure I will like this one too! So glad to hear you liked ‘The Second Chance’, Shannon, especially as I’d be the first to admit that it wasn’t anywhere near as fast-moving as ‘The Falmouth Connection’ and didn’t have quite as many ‘Elizabeth-and-Mr Darcy’ moments 🙂 So, fingers crossed, you might like this one as well. Thanks for visiting and commenting, and the very best of luck! I would love to have a copy I have been seeing all the beautiful pictures she has been posting and just can’t wait to read it!! Lovely to hear that, Tresha! I must have mentioned on the book’s Facebook page, I was in two minds about posting all those pictures and tampering with people’s imagination and their willingness to place Elizabeth and Mr Darcy in their own ‘happy places’ rather than in mine 🙂 Still, some of them were so pretty and romantic that I just HAD to share them. So glad you liked them, and I hope you’ll like the book too. Good luck in the giveaway! my gosh! what an excerpt! It looks like I will have to have some time to dedicate to this when I start reading it so I wont have to put it down! I’m so happy you liked the excerpt, Theresa! I thought I’d choose one of the most romantic ones for my guest-post on Meredith’s lovely site, which has always made me so very happy, with the lovely posts I always found here and especially with the wonderful wonderful welcome (thanks and lots of hugs, Meredith!!! 🙂 ). Thanks so much for your comment, Theresa, and good luck! You are so sweet, Joana!! I’m always so happy to have you visit! And I’m so thankful you want to do so! Unfortunately I have not read any of your books so I am missing out big time as I loved reading the excerpt from your new book, how romantic! I love Cornwall and was wondering if you watched the 1970s drama about the Poldarks. I thought it was brilliant and apparently the BBC are remaking this. Also interested to read that you have been to Lyme Park in Cheshire. It is my 50th birthday in a few weeks’ time and we have hired the Hunting Lodge in the grounds of Lyme Park for the weekend so I can spend my birthday at Pemberley. So excited and really looking forward to reading your novels very shortly. Hi, Michelle. Oh, what a lovely comment, thank you! I did watch Poldark, it’s one of my all-time favourites, and I can’t wait to see if Aidan Turner manages to fill Robin Ellis’s rather fantastic shoes 🙂 Somehow I think he will, it seems that he can do ‘brooding and romantic’ to perfection! What a fabulous birthday treat you have in store!!!!! Wow! Hope you have a wonderful 50th birthday at Pemberley! Yes, I went in the summer, to both indoor and outdoor Pemberley (Sudbury Hall and Lyme Park). You’ve probably visited both already but if you haven’t been to Sudbury yet, you really have to go while you’re in the area, they’re only 30 miles or so apart. There are some choice photos on my site (www.joanastarnes.co.uk) under the News tab (rather older news 🙂 but there we go). Luckily, Sudbury Hall allows indoor photography (though sadly Lyme Park can’t) so I took 400 or so (and drove my family crazy!). I didn’t post them all, but I hope you’ll like the ones that are there. Thanks for replying. I have all the Poldark series on DVD and have read all the books too. I do hope that they have cast the characters right. Apparently Robin Ellis is going to have a cameo role as the Reverend Halsey (?). Going to google your lovely pictures now! Hi Joana, Forgot to say don’t enter me for the e-book as I refuse to have anything electronic for reading as I adore books and holding out not having a kindle or anything similar although I know it would be so much more convenient!! Aidan Turner has huge boots to fill. I always wanted to be Demelza when I was a younger. Poldark is my all time favourite too. As I said before, I have never read any of your books but I think I will start with your new one as it is set in Cornwall, one of my favourite places. Nice talking to you Joana and I am v chuffed I have found another Poldark fan as I thought I was the only one! Lovely talking to you too, Michelle and I’m so pleased you like Poldark too. I’m sure there are plenty like us, and we’ll find more as the new Poldark draws nearer. And Aidan Turner is bound to make new recruits too 😉 Thanks for the email, great to have met you and please stay in touch! Michelle, what a brilliant way to celebrate your birthday! Have a marvelous time! 🙂 Please share your experience with us!!! Wow! Wow! Wow! Joana, this excerpt was…… WOW! I was so going to wait for the print copy but that’s not going to happen. I am off to order it now so please do not enter me. Wow! Loved the make out session and can’t wait to read the rest. Meredith, thank you for posting this today and disrupting my house cleaning. My husband may end up with only a sandwich for dinner as I read all day. Two thumbs up for you!!! I know the feeling Joy 😉 Wish I had my b’day party at Pemberley too! You’re so kind, THANK YOU, and sorry about your hubby’s dinner (though not so muchabout disrupting the house-cleaning, horrid boring stuff 😀 ). I’ll just go and check for the print copy, I’m hoping it will become available today. Thanks again for your lovely words and for being such an amazing friend! All the best and lots of hugs! LOL! Joy! I guess all I can say is sorry-not-sorry! 😉 Hope you had a blissful day! Got it. I’m off to Regency England. Just checked and the print copy is up and running too, hope you found it! VERY strange! Just up and running on Amazon UK so far, which is very unusual, because in the past Amazon com moved the fastest. Hopefully it’ll be live by the end of today! It’s now available in the US. Ordered!!! Of course, since I now have it on Kindle I don’t have to wait to read it. I did exercise a bit of self-control and got most of my house cleaned. We will barbeque (in the rain – welcome to Oregon in the fall) so cooking shouldn’t interfere too much with my reading. As soon as John turns in for the night I’m indulging in a trip to Falmouth. I love that I can travel to a time period that intrigues me and a place I’ve never been in the pages of a book (or a location on a Kindle). Thanks so much for this, Joana. Hope the barbecue wasn’t too wet! It gave me a giggle to read about it though, because it reminded me of us trying to BBQ on the weekend of the Queen’s Jubilee a few years ago. You might have seen some of the recordings and might remember the weather 😀 In the end we had to cook under a huge tarpaulin. Never give up, never surrender! The steaks were perfectly cooked. We just kept the grill under the eave of the garage. It made the whole neighborhood smell yummy, I’m sure. I do remember the Jubilee. Great attitude!!! I just finished To Refine Like Silver by Jeanna and will get to yours as soon as I load the dishes in the dishwasher. Jeanna and Joana on the same day. How’s that? Good luck in this giveaway in the meantime, and thanks for stopping by! This book is just wonderful! I’m almost done but I don’t want it to end!! Thanks so very much for joining in to tell me that, it really made my day! Hope you’re having a wonderful day too and all the best! Oh how cruel to end there! I must know what happens next. You have such a way with your scenes. I felt as if I was there in the darkness. Hope to win! Very cruel, I know! Sorry!!!! (I guess 😉 ) But I’m so thrilled that I managed to put you right there in the story with them, and that you like the set-up. Thanks so much for the lovely comment and best of luck in the giveaway! Meredith, you’d better make that two puddles! Joana, that was such a wonderful extract and so naughty of you to end on a cliffhanger like that. I loved The Second Chance and this sounds as though it’s going to be even better. I have happy memories of family holidays in that part of the world when I was growing up, so it’ll be great to revisit it, albeit in a wibbly-wobbly timey-wimey (to quote David Tennant’s 10th Doctor) fashion. Michelle Hall, sooo jealous of you and your 50th birthday treat. I’m also looking forward to the new Poldark, Joana. Aidan turner certainly has the looks for the part (drools on iPad) doesn’t he? Anji, I was completely unaware of who Aiden Turner is so had to Google him. Oh my!!! You have a gift for finding such attractive gentlemen. I pinned a photo of him on my Pinterest board for future possible Darcys. I am just pleased that my husband understands. Yours? So thrilled you liked the extract, Anji, and yes, very naughty, bad, BAD ME!!! Loved the idea of 2 puddles though 🙂 and as for drooling on the iPad / keyboard etc. over Aidan Turner, yep, I’m right there with you! 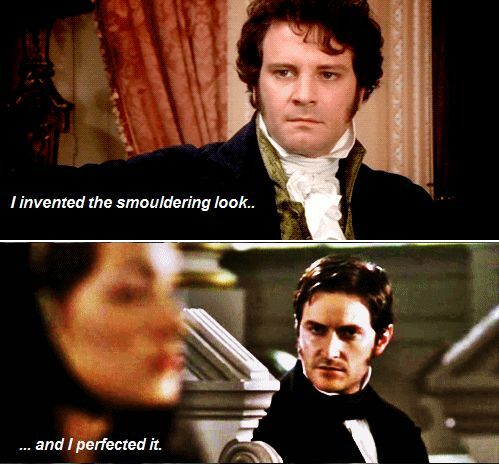 You’re so right, Joy, he’d make a perfect Darcy! Joy, if it’s anything to do with costume drama, I can drool as much as I like, cos my husband has absolutely NO interest in them at all and thus isn’t bothered about that sort of thing. Aftre all these years, he’s pretty understanding. Obviously, when the new Poldark series comes out next year, I’ll have to record it and then watch it while I’m doing the ironing! Joana, and Joy again, wouldn’t it be fantastic to see him as Darcy? He would smoulder in all the right places! Anji, you make me chuckle. Have you seen the picture of Colin Firth in his Darcy role where he says, “I invented the smolder”. and the picture below it shows Richard Armitage as John Thorton saying, “but I perfected it.” How perfect is that!!! I haven’t seen those pictures, Joy, sorry to say. I’ve also just remembered something from the time when Poldark fever was at it’s highest over here in the Robin Ellis days. My sister got a pet hamster, supposedly a female, and she named it Demelza. It eventually turned out to be a male. Guess what she renamed it? Hi, Joy. Yes it worked! Yum! I really loved this excerpt from the book and van’t wait to read it all! So glad you chose a scene of such romance. Thank you for the giveaway. Thanks, Lady Susan, I’m so glad you liked the excerpt! There are many scenes between Elizabeth and Mr Darcy in this story, I made a point of keeping them in the limelight for most of the time, and this was indeed supposed to be one of the 4-5 most romantic ones 🙂 So thrilled you liked it! Thanks for your comment and best of luck in the giveaway. Cliffs in the photographs make me think about Wuthering heights, do you know it? Have it in some way influenced you? Wuthering Heights is quite a powerful novel, Loren, isn’t it? Yes, I’ve read it and I’ve seen some pretty good adaptations too. I can’t say it influenced me in this instance, but I think the idea of turbulent emotions on windswept moors fits very well indeed with my next story. Thanks for stopping by and good luck! Yes, I love it! Thank you for your answer! That captivated me and I wanted to keep reading! Will put on my Wish List but if I don’t win a copy this is going to the top of the list and will be ordered after some of the others I am read are completed. Love the language, the angst, the sexual tension….HOT scene and Elizabeth just turned him down? So much mystery here as to what is going on with Lord T. and his men and why is Darcy in the garden as she comes back? Tantalizing woman! Great writing here – you know how to draw us all in and then pull the rug out from under our feet…LOL! I have to look up Aiden Turner and Poldarks. Just posted my first Pin Interest board so have a lot more to look at and add to mine. Sheila, I should be done by the weekend. Do you want to borrow it? I am laughing as this message popped up as I was adding this book to my Wish List. You are such a sweetie. We are barbequing here also as yesterday I went to Philly for talk by Kim Wilson on her book “At Home with Jane Austen” sponsored by JASNA and the Royal Oak Society…had tea at the Mary Cassatt Tea room and dinner in the city, took train, and didn’t get to bed until 1:15 am….so not cooking. My husband does grill! Yes…when you are done, dear lady. All smiles and giggles here! Loved your first message, Sheila and just couldn’t stop grinning as I read your lovely lovely words! Blushing too, but mostly grinning 😀 Thanks so very much! And then Joy’s and your next one – such wonderful friendships! We’re so lucky to have this happy JAFF world! Holy cow! I mean that I’m not saying that I think cows are holy, but… Wow! Joana, this is my FAVORITE of your books and you know how I felt about the Subsequent Proposal. I am stunned. Absolutely stunned at this story. It’s now in my top three JAFF ever (with The Journey by Jan Hahn and Pirates and Prejudice by Kara Louise). I have lots of others that I love by many different writers, but yours jumped to the top easily. I just sent it to you, Sheila L.M. Can’t wait to hear what you think. Got it, downloaded it and making a cup of coffee to sit down and start it. Dave of Oklahoma gave it a 5+ rating on Amazon, which means a lot to me also. Sheila, great to hear that! I think the world of Dave too, he’s a truly wonderful person, and his vote of confidence means an awful lot! Deep breath in…oh my, that was dreamy! And Elizabeth had just turned down his offer of marriage hours before!!!! I will have to add this one too to my wishlist. So many books, so little time!!!! Your pictures are amazing of Cornwall and it’s one place my husband and I would love to visit one day. Have you ever read any books by Susanna Kearsley? She wrote a book called “The Rose Garden” that takes place in Cornwall (past/present) that was really lovely. Loved Aidan Turner in ‘The Hobbit’ as I found him so endearing. I am familiar with Poldark but have never read or seen it. I will have to see if I can rent it from our local video/dvd store. Have a happy 50th Michelle…what an amazing gift too! Thanks, Carole 🙂 I’m so happy you liked it, and the pictures too. If you ever get the chance to visit Cornwall, I’m sure it’ll be worth your while! It has so much beauty and so much history too. I’ve heard of Susanna Kearsley’s books, someone recommended them a few months ago but I haven’t read one yet. Sounds like I really should. Aidan Turner is quite something! I don’t remember him in The Hobbit, but he was pretty good in the Desperate Romantics, a film about pre-Raphaelite artists. The Poldark series is quite old, 1970s, so I guess it was high time for a remake. Hope you can find it. If not, rumour has it that they’ll release the new one next year. Can’t wait! Ok I’m back. But a cliffhanger!? Ok I forgive you. What a fab excerpt. And that was after she turned him down? This one is on my bday wishlist. And the pics are just gorgeous. I’m jealous of all your travels. LOVED your comment, Monica & happy dance that you liked the excerpt! Sorry about the cliffhanger and the smelling salts though! The pictures are just breathtaking. Lucky Joanna! So glad you liked the excerpt and the pictures! Good luck and thanks for stopping by. I enjoyed your other two novels tremendously and I know this will be great as well as suspenseful. Please do not enter me into the contest as I don’t have an e-reader and do purchase the paperbacks. This one really sounds very interesting. I can’t imagine what is next in your great bag of tricks. Those photos were incredible. I loved it. How could you leave us hanging like that? This is torture. I enjoyed that excerpt very much. It’s very hard to wait for the rest of it. I’d love to win a copy. Love the pictures of one of my favorite sites in England. This was an intriguing excerpt written in a captivating style. Certainly leaves me wanting more! Cornwall is amazing, isn’t it, Regina Silvia? So glad you liked the photos and the excerpt! Thanks for reading and commenting, and fingers crossed in the givewaway! So glad you liked it Michelle! Best of luck in the giveaway! Hope to get my hands on it soon ! Best of luck, Nicole! I hope you do! Oh, be still my heart!!! I’m in the puddle with Meredith!! Joana, I’ve read your other books and enjoyed them very much. I really liked your bringing other Austen characters to interact and be part of the story. You’re an amazing writer!! I so look forward to reading The Falmouth Connection! I had forgotten about the Poldark books and the series, until mentioned above. Mid-1070’s I was a stay-at-home mom for the first time and enjoyed the series and books with my mom!! Thank you, Meredith, for bringing such great writers and books to our attention. Thank you SO MUCH for such lovely words, Catherine! I’m so happy you liked my other books and I hope you’ll like this one too. Yes, Poldark was hot news in the 70s but maybe it’ll become so again in 2015. We tend to go to Cornwall every summer, and somehow it just clicked to imagine Darcy and Elizabeth there. So much beauty, restlessness, romantic scenery – it just had to be done! Thanks again for your comment, best of luck in the giveaway, and huge thanks, Meredith for giving me the chance to showcase my stories and chat to so many wonderful people! We’ve got quite a crowd of puddles forming here, Joana! I was so excited to share this post with you all after Joana sent it to me! I could hardly wait! My pleasure, ladies! I absolutely loved this book. I purchased it as soon as it was released and much as I loved Joanna’s other books, this is her best yet. The intrigue and everything else that was wrapped up in this made it such a fast paced read that was so hard to puy down. Please do not enter me. I already have the eBook. You’re so lovely to pop by, Debbie, and thanks so much for your encouragement and support, you’ve been simply wonderful! Huge thanks for everything and so thrilled you enjoyed it! Sounds delightful! Thanks for sharing! Thanks so much, Stephanie, I’m so happy that you liked From This Day Forward and The Subsequent Proposal! The Falmouth Connection is in a very different vein, I haven’t written cloak-and-dagger before, but Cornwall definitely lends itself to it! I really have to read Susanna Kearsley’s book, it sounds like something I’ll thoroughly enjoy. So glad you liked the excerpt and I’m absolutely thrilled it got you hooked. Best of luck in the giveaway and if you’re one of the winners, I hope you’ll like it. Thanks for visiting and commenting! The cover of the book alone is intriguing and, yes, you did leave me wanting to know more! I could feel the safety that Elizabeth felt – it was safety and trust. I am so looking forward to reading this book as I have enjoyed all of your books. Thank you for the giveaway. Thanks for the lovely comment, Eva! I’m so glad you liked the cover and the excerpt, and that it conveyed just the right message: that the one Elizabeth could fully trust is her soul-mate, even if it takes her a fair old while to realise that 🙂 Good luck in the giveaway and thanks for taking part. Okay, so “The Falmouth Connection” has bumped and elbowed its way to the top of my To Read List – I want to read it, and I want to read it NOW. Wonderful excerpt, Joana, and I love the title, too. Good luck and love to you, and thanks for the giveaway. Thank you as well for responding to all of our comments – how generous of you to take so much time to personally connect with us. Not generous at all, Lilyane, it’s my absolute pleasure!!! I couldn’t possibly miss the chance to connect with such wonderful people and thank everyone for their amazingly kind words 🙂 Thank YOU for telling me that you loved the excerpt and the title and that TFC has bumped its way up on your reading list, it’s great to hear it! Best of luck in the giveaway and if you win I hope you’ll like the whole story. All the best and thanks for taking part! Thanks, Maria! Best of luck in the giveaway, and I hope you like it! LOVED the excerpt…would love to win a copy, but definitely going on to be read list.. Thanks, Stephanie, much appreciated! So happy that you loved the excerpt. I thought long and hard which one to use and I’m thrilled this was a good choice. Good luck in the giveaway and thanks for stopping by to read and comment! Can’t wait to read to find out what happens. Joana thank you for the giveaways and Meredith for hosting! So glad you liked the excerpt and sorry about the cliffhanger 😉 Thanks for reading and for taking part in the giveaway, and best of luck. Hope you’ll like the answer to the questions! My pleasure, Dung! Best of luck! Author Joy Dawn King did lend this to me…so graciously and I read it and loved it and posted a 5 star review on Amazon, also! Must read book for all JAFF readers. Thanks so much for the amazing review, Sheila, as well as for the wonderful ones you posted for all my other books! I’m absolutely thrilled, you really made my day! It’s not always easy to match a user-name with another and more often than not I don’t know whom I should thank for lovely words that leave me grinning and blushing. So happy that I know I can thank YOU. Much, much appreciated! You’re welcome – well deserved! Wait, what?! It ends there?! Very nicely written! Oh dear! Sorry about the cliffhanger, Brenda 😉 I’m so glad you enjoyed it though! Thanks for reading and commenting and good luck in the giveaway! The excerpt is so exquisite and entertaining. I don’t like it to end on a cliffhanger. 🙁 I must know what happened next. Thanks for offering the prizes, Joana. So glad you liked the excerpt and sorry I missed your comment! I’m replying late and the winners have already been announced. So sorry you weren’t one of them but guess what, there are still giveaways ongoing and a few still to come 🙂 More details on The Falmouth Connection Facebook page. Hope to see you there!